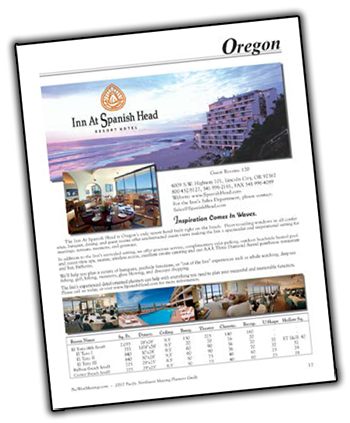 For 32 years, the Pacific Northwest Meeting Planners Guide has provided meeting and event planners detailed information on locations they are seeking, utilizing the preferred FULL PAGE format in a perfect bound, professional, beautiful magazine. The printed guide is published in March of each year. Each section of the guide begins with the state's map showing the locations of the venues with the page number to quickly find the detailed information you’re looking for to host your next meeting or event. This section is featured in both the printed / digital guide and website for meeting planner services and event management, decorators, audio / visual & lighting, catering services, bartending services, entertainment and disc jockeys, guest speakers, rental services, florists, photographers and videographers, transportation services and more. Our new website now features each venue on both the individual state pages, plus a professional search engine so you can quickly find the online profile of the meeting or event venue that fits your needs in an easy-to-view format. This new concept of engaging with venues and their staff features photos, video, detailed meeting and event space information, amenities, and direct contact information. Meeting and event planners will now be able to search the website by venue location, available meeting spaces, hotel accommodations, restaurant and food service facilities, audio/video capabilities and many other important categories. Signup for our weekly newsletter to keep informed regarding new venues, latest improvements of existing venues, meeting and event planners resources and the latest news from MEETING NEWS NORTHWEST MAGAZINE.